Accepted: First, can you tell us a little about yourself: Where are you from? What and where did you study as an undergraduate and when did you graduate? Charlotte: I grew up in Atlanta, GA and attended Dartmouth College, graduating in 2002 with a degree in Art History. I worked on Wall Street at UBS for the next couple of years but ultimately decided that finance was not my calling. For the last six years, I worked as a real estate developer of hotels for a REIT based in Palm Beach, FL. However, although I lived and worked there, my territory encompassed regions as far-flung as Seattle, Long Island, DC and San Diego. So I traveled a lot! One of the perks of my job, although I didn’t know it at the time, was that I had a project obtaining the entitlements for a hotel in Los Angeles. Frequent trips to LA over the course of two years introduced me to the city, and I fell in love with the amazing weather and the many unique towns that make up LA as a whole, particularly the charming and beautiful beach towns of Hermosa and Manhattan Beach and Santa Monica. When I was accepted at UCLA Anderson, I already knew that LA would be a fantastic place to spend two (or more) years! Other sound bites about me: I am getting married in March (over Spring Break! ), and my fiancé lives in LA with me and owns an e-commerce company that specializes in hotel marketing. Also, I am an avid marathoner and triathlete and have raced 11 marathons, including Boston, and many triathlons, including two Half Ironmans. Accepted: Why did you decide to attend Anderson? Is the program meeting your expectations? Charlotte: I chose Anderson because I wanted to go to school in a city to have the advantages of many different businesses and corporations in my backyard, and I favored the climate in California to New England or the Mid-west. I knew Anderson by reputation: some of the alums from Anderson are people that you read about daily in the WSJ, and others are people who while not as well-known globally, are known to me personally and are accomplished, successful, good people who are fiercely loyal to their alma mater. I knew it was a great choice, but Anderson is still exceeding my expectations. The school’s clear focus on its students’ success is evident from big things to the very small. For example, the Orientation program clearly takes months of planning and dedication to accomplish as much as it does. There are the big things, like the opportunity to ease back in to school with our first “course” taken pass/fail with a terrific professor, the chance to bond with your section through events like Game Day, Section Competition, and the 80s Party, and true character-building experiences like the high ropes course on Odyssey Day where you realize you are tougher than maybe you realized. But there are also the little touches, like fresh breakfast served every day, or the fact that you are assigned a different seat at every lunch so that you have the chance to meet as many classmates outside of your section as possible, that tell me how much of a comprehensive experience Anderson strives to make itself. Accepted: The urban shores of LA are a far cry from the White Mountains that surrounded Dartmouth — how does this affect the learning experience, and which do you prefer? What are some of your favorite things about living in Los Angeles? Least favorite? Charlotte: I am fiercely loyal to Dartmouth, loved my experience there, and highly recommend it to anyone for undergrad. Rural New Hampshire was a wonderful place to go to school, and I was really able to focus on schoolwork and friendships without the distraction (or high cost of living!) of a more cosmopolitan area. The White Mountains and Connecticut River and the Dartmouth Skiway were just a few of the perks of the New England location. However, these very things that made it great to be an undergrad are less valuable and even a detriment for a graduate student in business. The same cozy isolation that fostered lifelong friendships in college means I would be removed from thriving business centers. Right here in our own backyard in LA are more Fortune 50 companies than anywhere else in the US except the Bay Area. And speaking of the Bay Area, it is only a 5.5-hour drive away. In fact, one of the associations I am a Board Member of, the High Tech Business Association, is sponsoring a “Days On the Job” event next week where association members are invited to visit 5 of a possible 22 notable Bay Area companies, including Google, LinkedIn, Twitter, eBay, Cisco, Pandora, Visa and more. It is easy for us to find academic internships during the school year at the many companies and start-ups in the LA area, and it is easy for recruiters to reach us. Los Angeles itself is truly fabulous. Having lived on the East Coast my whole life and as a lifelong devotee of New York City, pretty much the greatest place on the planet, I did not expect to love LA as much as I do. But it really wins you over. It is the focus on the outdoors, and the integration of the ocean and beach in everyday life, and all the other perks afforded by year-round good weather that give the City such a positive vibe. People are happier and healthier, restaurants all have outdoor patios, malls are open-air, and there are local parks everywhere and huge state parks within a mile of the UCLA campus. The culture is a true melting pot, which makes for great diversity and of course, fabulous food. The best we’ve enjoyed since we got here are authentic Korean and Japanese dishes that cost under $7 each from local hole-in-the-wall restaurants that I would never dreamed of finding in Florida. There are also a lot of great healthy, vegetarian options, which makes my life a lot easier. It comes as no surprise to learn that my least favorite part of LA is the traffic. However, if you don’t live too far from campus, it’s really not that bad. Just be sure to ask prospective students if the neighborhoods you are targeting make sense before committing to a lease! Accepted: Did you consider yourself an ‘older applicant’? Did your experience level pose a challenge and how did you handle it? Charlotte: I am older than the average student at Anderson at 31 years old, but not so much older that I really notice. I have several classmates approximately the same age as me, but I think what really makes the gap seem small is that it takes a person with a certain level of maturity and drive to know they want to sign on for business school. Not every 24 or 27 year old could articulate what they want out of life and know that they need to spend an extremely large amount of money acquiring an MBA to get it, so right away you are not looking at a random sampling of people in their 20s, but only select motivated ones. Charlotte: The fall quarter is the only quarter at Anderson where we don’t have any choice in our classes, as we all have to take 5 “core” classes: Managerial Economics, Financial Accounting, Marketing Management, Data and Decisions (don’t be fooled by the name, this is Stats! ), and Management Communications. For a liberal arts major many years out of school like me, there is a steep learning curve! However, I enjoyed all of the classes because I learned a lot of fascinating new material. It was more stressful in terms of having to get good grades! My favorite class was Econ with Prof. Wacziarg, who is an example of exactly the type of top-notch professor you expect at a school of Anderson’s caliber. He is a prominent researcher in his field of course, but in class, he is wry, funny, engaging, and manages to make a somewhat dry subject interesting and learnable. I came away from his class with not only a much deeper knowledge of economics than you would expect after a mere 10 weeks, but with a mentor for the next two years. Accepted: As a first year student, have you had much contact with Anderson’s career services department? What is the best thing Anderson has done in terms of recruitment (either for post-MBA or summer internship positions)? Charlotte: I think the question isn’t so much have I had contact, but are the advisors in Parker CMC sick of me yet?? I meet with David Cooley literally once a week for continued guidance as I navigate the summer internship hiring process, and he has done wonders in helping me with a career switch and in bolstering my confidence as the time to actually apply for internships nears. (Although there are on-campus recruiting events all fall, companies are not allowed to actually collect resumes and begin interviews with first years until after first quarter is over.) First it was revising my resume, then working on cover letters, then getting networking advice, then practicing interviewing…the list goes on. Everyone in the office is very helpful and friendly and makes a point of aligning their goals with yours. For example, I decided I wanted to conduct an “Interview Practice Blitz” for any interested students over the Winter Break, and the staff helped me coordinate the event and reserved rooms in their own office for it. In addition, they are working hard not just with the students to be sure we all get the job of our dreams, but by reaching out to potential employers. They work tirelessly to cultivate relationships with top companies from around the country, as well as start-ups and others in our own backyard, to ensure that Anderson is on everyone’s list when it comes time to recruiting. I feel like I have a ton of opportunities here thanks to them. I can’t say enough good things about everyone in the Parker office. Accepted: Can you recommend any cozy places to study, drink coffee, and shmooze near campus? Charlotte: Westwood is the town that UCLA is in, but that is more where the undergrads hang out. Most of us live in Brentwood, just west of campus across the 405, which is a really great, walkable neighborhood with lots of fun restaurants, activities, and running paths. Most of the “nightlife” we engage in is there, in Westwood, or Santa Monica, also a terrific neighborhood and place to live, but a bit farther from campus. Most of us study on-campus in the beautiful library with its three-story wall of windows or the coffee and sandwich shop right on campus, Il Tramezzino. When you get sick of your classmates, walk 5 minutes over to the Northern Lights café which has self-serve fro-yo a la Yogurtland and a salad bar. 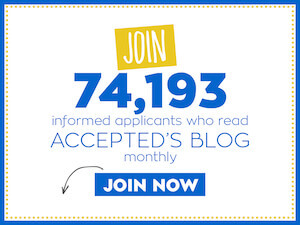 Accepted: Do you have any admissions tips to offer our UCLA Anderson applicants? Charlotte: One of the things I most appreciate about Anderson, and I think serves as a real advantage for the school as it continues to gain prestige and cultivate itself into a Top 10 institution, is that they do not have a formula they look for in applicants. Whereas some other top schools are known for mostly accepting former bankers, consultants, and people who scored 800 on their GMAT, Anderson is a school that looks at the whole person. Whereas using one of the many essay questions in an application to communicate a personal story might have turned out to be a liability at other schools, it was an advantage at UCLA. I say this not only based on their enthusiastic acceptance of me, but also the quality of my fellow students. What a fantastic group of people. Not all of them have backgrounds that would make it past some of the more formulaic screening processes, but Anderson wisely sees their potential. Every day, every hour, I am amazed, surprised, and delighted by the sheer intellect, ambition, savvy, wisdom, goal-orientation, creativity, and overall high caliber of each of my fellow students. This is truly a top notch institution to have attracted such amazing talent. There is no doubt in my mind that many people I walk the halls of Anderson with today are going to be tomorrow’s Fortune 50 CEO’s, start-up darlings, and revolutionaries in the non-profit space. It’s just an added bonus that everyone is also friendly & helpful, normal (loosely defined), and quite often, hilarious. My advice for applicants would be to make sure you are authentic and honest. Make it clear where you’ve been and where you’re going and what you want out of your Anderson MBA. Show your drive and show that you’ve done your research into the school. Anderson has big goals to become a better and stronger institution with every passing day, where do you fit in? Good luck! Please visit our UCLA Anderson B-School Zone for more Anderson-specific advice. Still haven’t decided which b-schools are best for you? Download our FREE special report, Best MBA Programs: A Guide to Choosing the Right One for You, to help you narrow down your choices and begin your application efforts out on the right foot.